Scientists in Chile are trying to unravel the mystery of dead birds including penguins and baby flamingos and a massive die off of sardines. In the last few months, thousands of dead Humboldt and Magellanic penguins washed ashore in late March. Along with them tons of dead sardines showed up as well. 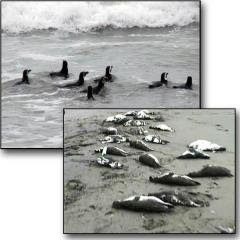 The animals littered the beaches in the southern portion of Chile’s Region XI. About the same time, further north in Chile, scientists found rare Andean flamingos had abandoned their nests leaving 2,000 unhatched chicks to die. Some fear that global warming is the culprit and others think the cause might be overfishing, pollution and bacterial disease. In the case of the penguins, some believe they got caught in fishing boat nets – something that has been known to happen according to local authorities. So far the three ecological events are unrelated but more study is undergoing. This entry was posted on Tuesday, May 19th, 2009 at 3:23 am and is filed under Uncategorized. You can follow any responses to this entry through the RSS 2.0 feed. You can skip to the end and leave a response. Pinging is currently not allowed.